Warning: please be aware there may be mention of dental pain in occasional descriptive detail. I may also spare you the information dear readers however it is one of the reasons I found inspiration for this latest article. Diminished creativity has been hindering my penmanship for some weeks and unlike the expected normality of scribing a blog piece once a week if not more, I find it far more satisfying to write on subjects of genuine interest and enlightenment to both myself and the general public than an everyday subject of minimal curiosity (such as my recent tooth extraction which has removed most of lifes pleasures from my daily routine. There, I said it). I can enlighten you on the subject of healing gums later though as on a muted Tuesday evening, I was most delighted to witness the concept of the Pop-Up Circus in an unassuming North London home, introduced to me by the wonderful musician & singer/songwriter Alice Zawadzki (a talent whom I would also encourage you to witness live yourselves). The namesake for this genial showcasing platform (brought to the masses through the wizardry of Simon Roth) could betray it to be perceived as a colourful show of spritely acrobats but there is certainly colour though, pooled from talent brought before you by this wonderful collective of creative individuals. There is one thing to be said about musicians, particularly trained musicians and that is their dedication and inane ability to multi-task. It goes without saying that at a dinner-party for example, you may be approached with the question of ‘What do you do?’ and respond diligently with a summary of ‘Accountant’ or ‘Manager’ for example, which does not always invite further inquisition as much can be surmised by the title. Musicians often get the same acclaim I find, however their roles do not begin and end on a weekday and perhaps due to the unusual abilities that they possess there is a constant need to test ideas and creative output in as many projects as possible. The majority of musicians I know, that dedicate their livelihood to the performance of their art, tend to work on multiple projects, never just one. So my affinity natural gravitates to these souls, artists that (like myself) cannot label their output to just one deed or activity. I was able to watch the passion and emotion of these masterpieces unfold freely from the strings of a violin and piano, for the mere price of sharing some plates of food. Un-ticketed (just reserving a place) this was a true honour for me to be welcomed into the home of another, effectively strangers, and permitted to treat their living room as a concert hall (which seemed to command the same respect as I sympathetically overheard a bystander painstakingly attempt to open a can of beer with endearing embarrassment, so as not to distract the violinist at her crescendo). And unlike the concert hall formalities that can come when paying a princely sum for the benefit, you instead share the venue with friends, this being the 2nd of their ‘Living Room Concert’ performances. 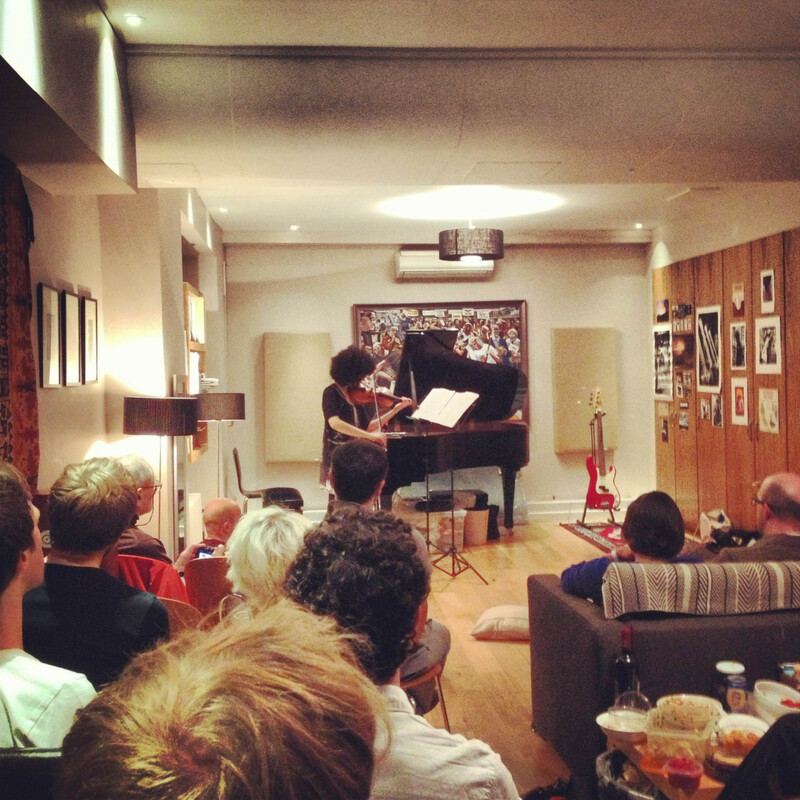 The first part of Aisha’s performance incited thoughts of Victorian parlours, gatherings to warm the gloomy London winters with affluent friends and families, comforted through the ears by beautiful instruments to cheer the spirits. After the interval though, my senses were awoken by more modern composers, particularly that of Austrian Johannes Maria Staud who was only born in 1974. When Aisha played Of a Brighter Hue my skin tingled with excitement by her approach to the notes she was playing. She slid her bow so sensitively over the strings, at moments eerily silent to then suddenly launch into a frenzied assault on the violin’s body, invoking chills and astonishment that such an effect could be stirred from a single person’s astounding ability. These gatherings are relatively unfunded, conceived from word of mouth and networks of musical/artistic souls to then be brought together, purely to provide accessibility to others, a link between worlds encouraging members of non-creative circles to step over the threshold to experience and consume their talent. Their occurrences are sporadic (but it is understandable seeing as the need to pay rent must still take priority) however they are consistent and have been collaborating for a few years already. Searches are always on for the next hosting venue and there are always open arms for creative input so this should certainly be a mailing list to add yourself onto. I would encourage you to attend when not in a state of oral discomfort as the temptation of both food and wine, so generously provided by guests, is both torturous and saddening to refuse. You can at least receive delicious sustenance for your SOUL though; at least the dentist cannot extract this receptor of pleasure.